The Embassy Suites Dallas Park Central is conveniently located in the Northwest corner of the intersection of Hwy 75 and I-635, the gateway to the North Dallas Telecom Corridor. Our neighboring corporations include Boeing, Raytheon, Boeing, Texas Instruments, Zurich North America, FedEx Office, CompuCom Systems, Brinker International, Interstate Batteries, General Dynamics, Lockheed Martin, Northrop Grumman, AT&T and Verizon. 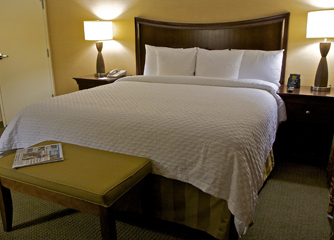 The hotel location provides easy access to both Dallas Love Field and Dallas/Ft. Worth International Airports. Our Dallas hotel completed a $12.3 Million transformation in January 2009 with you in mind! Our luxurious two-room suites, spanning nine stories, are designed with extreme comfort and convenience in mind. Each includes two 37" Flat Panel televisions, two telephones with voicemail, refrigerator, microwave, Café Express coffeemakers with Rainforest Alliance blend coffee & Eco friendly cups, Exclusive BLOOM Aromatherapy "Energy-Rosemary Infusion" bath amenities, and Embassy Essentials® Bedding Collection. Dining at our hotel provides you with an on-site solution to hunger. From dawn to dusk - complimentary cooked-to-order breakfast and Evening Manager's Reception including cocktails with light snacks to the Riparian Grille Cuisine and Gastronomy Bar, we have created menus that will satisfy even the most discriminate palettes with Tapas, Specialty Coffees and Bubble Teas. Most special dietary requirements can be met by asking a member of our hotel staff. Our hotel is the perfect location to Dallas local attractions including Dallas Arboretum, Dallas Arboretum, Conspiracy Museum, The Sixth Floor Museum at Dealy Plaza, South Fork Ranch, Mesquite Rodeo, Dallas Cowboys New Stadium and Six Flags over Texas!